New research shows that thyroid disorders affect far more people and cause many more health problems than doctors thought just 10 years ago. Now it has become a major health problem even in the developing countries. This ebook deals with the subject in all completeness and clarity covering all aspects of 'Thyroid Disorders'. Many ayurvedic practioners are adopting a vague approach. Because the main obstacle in understanding the thyroid disorders is that there is no exact correlation of the thyroid gland in Ayurveda. But the ayurvedic system of medicine is very futuristic and it doesn’t emphasize on naming the disease. It rather insists on understanding the constitutional status of the disease and adopting the appropriate treatment principles. For that, knowledge of etiology, pathogenesis and diagnosis is very essential. The main action of thyroid hormone is to act as a spark to pep-up body metabolism by increasing the oxidative phosporylation in the mitochondria. 'Thyroxine is also one of the factors which regulate the metabolism. Author Dr. V.V.Lakshmi Prasuna, has successfully correlated this action with the actions of Agni , typicaly Dhatwagni, descibed in Ayurveda. This book is divided into 4 parts. First part deals with the normal physiology, second part is hypothyroidism, third part is the hyperthyroidism and the fourth part is goiter. 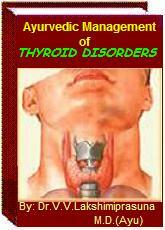 The second part deals with the hypo functional state of thyroid gland, i.e. hypothyroidism; the etiology, primary, secondary, tertiary hypothyroidisms, congenital (previously known as cretinism), juvenile and adult hypothyroidism, Hashimotos thyroiditis, are included along with their treatments. In third part Hyperthyroidism Graves disease, Toxic MNG, Toxic adenoma, carcinoma, Struma overii, Hydatiform mole etc. are mentioned along with their treatments. In Goiter different varieties of Benign, Malignant Neoplasm, thyroiditis are described with their treatmentsin fourth part. By far 'Thyroid disorders' are the most misdiagnosed diseases. For accurate diagnosis of the disease, more than 80 clinical features of hypothyroidism and nearly 120 clinical features of Hyperthyroidism are compiled in this ebook. It would be unwise to try in vain to tackle the disease by drug only. That is why pathyapathya (wholesome and unwholesome diet and regimen) are mentioned for the above diseases. An attempt has been made to elaborate the treatment principles (keeping the etiology in view) about the thyroid disorders without distracting the basic philosophy and precincts of Ayurveda. Some useful and popular herbs and their different preparations are mentioned in this ebook for the convenience of the patients and practioners. In short Dr. V.V.L. Prasuna has aptly revealed the Secrets of Mastering the Thyroid Disorders with the help of Ayurveda. Her great work is very useful for patients, students, practitioners, researchers and for those who are interested in Ayurvedic Science. We are	offering 'Winning Over Depression' in eBook form!